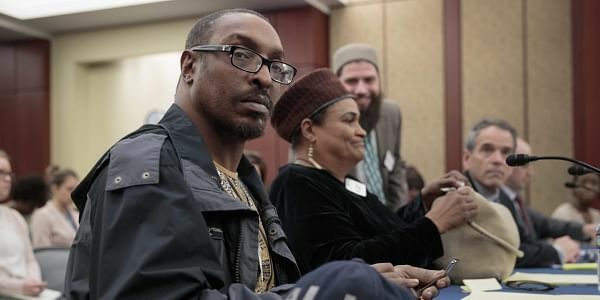 Muhammad Ali Jr. was detained and questioned at a Washington airport before being allowed to board a flight to Fort Lauderdale after meeting with lawmakers. Muhammad Ali Jr. was detained and questioned at a Washington airport before being allowed to board a flight to Fort Lauderdale after meeting with lawmakers to discuss a separate airport detention incident last month, a lawyer for the late heavyweight champion's son said Friday. Ali and his mother, Khalilah Camacho Ali, were stopped at the Fort Lauderdale-Hollywood International Airport after returning from Jamaica on Feb. 7. They travelled to Washington on Wednesday without incident to speak to members of a congressional subcommittee on border security about that experience. But attorney Chris Mancini said that when Ali attempted to board a JetBlue Airways flight home to Florida on Friday he was detained for 20 minutes. Mancini said Ali spoke to Department of Homeland Security officials by telephone and showed his driver's license and passport before he was allowed to board. "None of this was happening Wednesday," Mancini said in a telephone interview Friday afternoon as he was traveling with the Alis. "Going to Washington obviously opened up a can of worms at DHS." A spokeswoman for the Transportation Security Administration acknowledged the agency confirmed Ali's identity before he boarded his plane. Florida Democratic Congresswoman Debbie Wasserman Schultz, who was on the same flight, tweeted a photo with Ali after he was allowed to board and wrote: "On way home on DOMESTIC FLIGHT Muhammad Ali Jr. detained AGAIN ... Religiously profiling son of 'The Greatest' will not make us safe." The mother and son, both born in the United States, have said in interviews that they believe they have been stopped because they are Muslim with Arabic names. Earlier this week, they announced a campaign for religious freedom in the spirit of the boxing icon, supported by ex-boxing greats Evander Holyfield, Larry Holmes, Roberto Duran and others. They say they are opposed to President Donald Trump's travel ban, which they feel unfairly targets Muslims.